Roofing company specializing in roof replacements and roof repairs. 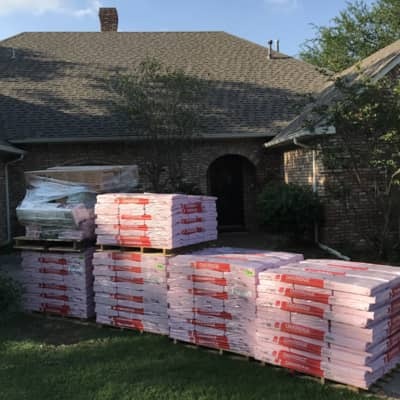 ​​Lonestar Exterior is a family owned business composed of roofing and fencing contractors who offer highly professional residential and commercial services around Denton, Texas. We offer services in locations besides Corinth as well, such as Denton, Lake Dallas, Argyle, Lewisville, Highland Village, Bartonville, Flower Mound, as well as other local areas. Our roofing process is simple and cost effective for our clients. We start off with a free inspection. If we notice a problem, we contact our customer’s insurance company and handle the costs with them. This is to ensure the easiest process possible for those working with us so we can get the job done quickly and efficiently. To prevent further damage, give us a call as soon as the hail storm is over. Our roofing and fencing company has experienced employees ready to work on your next project, and we cannot wait to get started on any repairs you may need. With over 20 years of experience in the DFW roofing industry, we have seen all kinds of roofing issues. Whether you are dealing with water damage, hail damage, or wind damage, we are here to repair your roof in a timely manner. Roof repair is a bigger concern than most homeowners and business owners think. Every roofing shingle weathers over time, whether it is a three-tab shingle or a class four impact resistant shingle. Because a lot of the roofs in Corinth have basic shingles, or what we call three tab shingles, fixing your house can be frequent and costly. Let one of our contractors nearby take a look and see what we can do to help! Our contractors also have a great deal of experience with fence installations too. 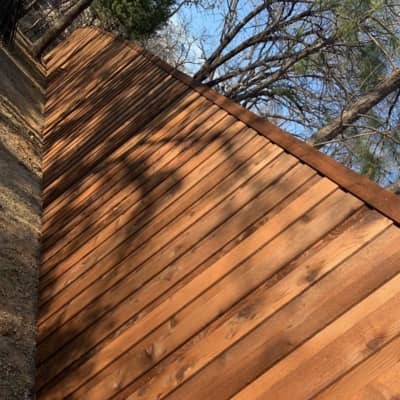 Fencing can be very important for both homeowners and business owners. For residents, a fence may be one of the first things someone sees on your property. Proper fencing may also increase the value of your home, while fence damage and neglect may very well lower your home’s value. For business owners, properly installed fencing can make your business look more professional. Whether it be roof repair or fence repair, we have you covered. Doing a job like roofing or fencing yourself could be time consuming, even dangerous, depending on what you have to fix. Give us a call, we have professional roofing and fencing contractors nearby who are ready to help. Our goal is to offer the best service around to all of our clients. Feel free to explore our website to get specific details on what our company can provide in your area. The process of replacing a roof can take anywhere from two to six weeks, depending on how quickly we can get an insurance adjuster out to assess the damage, size of the roof, and materials needed to get the job done. We do our absolute best to complete this procedure as efficiently as possible for our clients. Our process involves a free inspection, working with our clients’ insurance company to handle costs (and to correct anything they might have skipped out on paying), and replacing or repairing the old roof. Stripping down the old and installing new shingles only takes a day, two days at most. We always communicate with our clients so they know everything that is going on during our installation. We want our process to be as effective as possible because no one wants an issue like roof replacement to be so time consuming. We also want our clients to be as stress-free as possible during repairs. There are a lot of moving parts in roof replacement, and with our help, we can help make this process run a lot smoother, not only for the client, but for their insurance company too. This way, we can focus on fixing your roof the right way. Roof repair without professional experience is no easy task. This is why we are here. Let us do the hard work inspecting your roof, finding the damage, working with your insurance company, and getting your home back to normal. After all, our contractors are specialized and dedicated workers in this industry. 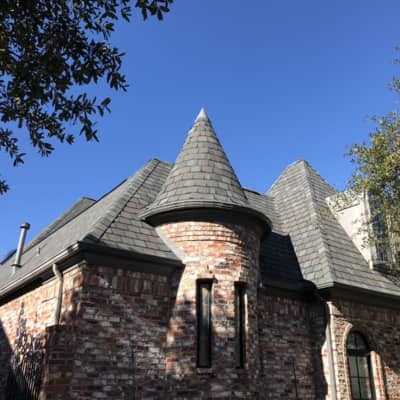 We have seen all kinds of issues throughout our years of experience so we can solve a variety of roofing problems, including whatever you may be dealing with. With the amount of hail North Texas gets hit with regularly, it is important to keep you house in top notch condition. There are quite a few roofing companies around Corinth, Texas, so why choose us? Many of these companies are professional like we are, but do not include the same customer service approach we have to offer. We treat our customers like family. Our motto is “Let us treat your home as if it were ours.” This is a great core value to have as a company in an industry with many “fly-by-night” storm chasers. We want a long lasting relationship with every single one of our clients. Many residential roofs have three-tab shingles, which is not as safe for environmental conditions in Texas. If you have storm damage and your house has basic shingles, we will upgrade your house to a more hail resistant, architectural shingle, free of charge. This is our way of giving back to our community. No one deserves unnecessary damage because their home was not properly prepared. We are a family owned and operated business and we will treat your home just like it was our own. These are the principles our company was founded upon and it is the exact same way we operate to this day. Roof replacement is the last thing you want to worry about when running your business. Whether you just bought your new office space near Corinth, or you have been running the same shop for years, storm damage can always occur. You want a roofing company that can do an effective job fixing your commercial space so you can get back to work. Whether it be a simple repair or a lengthy project, we have you covered. Roof damage on commercial buildings can be hard to spot. A simple leak could turn out to be a complex roofing issue, so let us check it out and get your office back to normal as fast as possible. Our company guarantees to do its absolute best getting your business back on track faster than other roofing companies in the area because being local business owners ourselves, we truly care about helping other local businesses. If you notice storm damage, to be on the safe side, it is always highly recommended to call an expert like us even if you are not sure if there is a problem or not. Inspections for building damage are free of charge, so do not hesitate to call us so we can get you a quote as soon as possible! We also work with fence replacement. Contrary to popular belief, fencing is not a one-time installation. Regular maintenance is recommended, as fences become worn out over time. When hail hits the area, damage is often done to your fence. Insurance will often cover the damage as well. Even if you have minor fencing damage, do not be afraid to give us a call and ask any questions necessary about your specific situation. You should repair your fence as soon as you see damage before it worsens and becomes more expensive. Rest assured, we will fix your fencing issues for an affordable rate. We work with a variety of materials for fencing installation. You can view the type of fence materials we work with here. With the various materials we work with for fences, we can install or repair the fence you like, when you like. Our workers are always on call and ready to fulfill your extensive fencing needs. Give us a call to discuss your plans for fencing solutions. We will be more than happy to answer any questions you may have for installation, repair, as well as any other types of inquiries. Many roofing companies in the Texas area do not offer as much to their clients as we do, which is why we consider ourselves to be unique. Offering a free inspection and being as open as possible to our customers is what sets us apart. We are a community-oriented based company because we genuinely care about the Texans in our area, and protecting homes is one thing that we can confidently do to help those around us. We also upgrade our clients roofs from three tab shingles to architectural shingles for free because we want the residents in our community to be safe and feel prepared for any weather condition. Lonestar Exterior is a company that is ready to work for you. We have experienced contractors in both roofing and fencing repair. With deep roots in Texas, we are here for the local residents and businesses to meet your needs and get the job done the right way, just the way you want it. We want what is best for our clients and for our community so we put that attitude into every single job we do. Call us and explain your problem. We will be more than happy to check it out! Please call 940-242-4326 if you would like to schedule an appointment for roof repair or fence repair. You can also fill out a form on our website at the top of every page. We are also here to answer any questions you may have about your roofing or fencing situation before making an appointment. We look forward to hearing from you and having the possibility of working together, getting your house, office, or fencing back in shape. We are excited to help you with your project and we would be more than happy to have you talk to one of our experienced contractors about what you need done. We look forward to your call! As a family owned and operated roofing company, it was important for us to settle our family in a good location. Growing up all around the Dallas Fort Worth Metroplex, we loved it. Not only does North Texas get hit with hail every few years, but the people are unbeatable. It is easy to find high-quality contractors and even easier to find high-quality customers to serve. Let us give you the peace of mind with a completely complimentary inspection. As of right now we serve all of North Texas and the DFW metroplex. Our office is in Corinth, but we serve all the surrounding areas such as Denton, Argyle, Flower Mound, Highland Village, Lake Dallas, Bartonville, as well as the more extended cities such as Dallas, Fort Worth, Plano, Prosper, McKinney, Frisco, Krum, Sanger, and Aubrey. We are willing to travel wherever you are in order to get you taken care of.